There’s a lot of ground to cover in the world of flooring. Vinyl has been a popular choice for its durability and wide range of styles for many years. 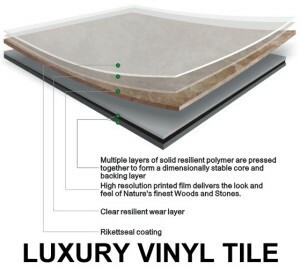 With the introduction of luxury vinyl tile (LVT), understanding how it compares to the traditional vinyl composite tile (VCT) is a popular topic. Vinyl itself was discovered by accident in the 1920’s in an attempt to create an adhesive. It was immediately recognized for its durability and used in a number of applications including floor covering. VCT consists of about 8-12% vinyl with limestone and clay making up the difference giving it a porous composition which requires regular maintenance to keep it sealed. LVT on the other hand is composed of 100% vinyl which eliminates the need to seal and gives it superior strength. LVT has been around for a few decades and its application is widely used commercially and residentially. It is easy to install, easy to maintain and even comes in very realistic looking wood grain. It is less noisy than VCT and hardwoods and also less permanent, making a design change less of a hassle. It may come as no surprise that LVT is the preferred flooring option for healthcare facilities where, along with heavy traffic, there are many chemicals in use that could easily make their way to the floor. VCT is less expensive than LVT (about $4 less per square foot) and, along with its competitive durability, remains one of the most common flooring solutions for places with heavy foot traffic. Regular maintenance can add up in cost however, and while LVT may be initially more expensive, it essentially pays for itself over time because it doesn’t necessitate being stripped and resealed. The average cost to maintain VCT for a duration of 22 years adds up to about $25 per square foot. r.o.i. Design is working with an elementary school where initial budget and familiarity with the maintenance involved with VCT has made it the best choice for their science room. Vinyl flooring is the popular choice for durability and ease of maintenance…knowing whether LVT or VCT is best can be overwhelming, but r.o.i. Design has got you covered.